The Ouagadougou Partnership was formed in 2011 by the governments of Benin, Burkina Faso, Côte d’Ivoire, Guinea, Mali, Mauritania, Niger, Senegal and Togo to address the need for modern contraceptives in Francophone West Africa. The nine countries seek to increase the number of women electing to use modern contraceptives by 2.2 million between 2015 and 2020. Francophone countries in West Africa have among the highest rates of maternal and child mortality in the world, and their rates of modern contraceptive use are among the lowest. Expanded and improved contraceptive, maternal and newborn care would enable more women and couples to have the number of children they want, plan the timing of their births, have safe deliveries and keep their newborns healthy. According to 2018 data, 5.8 million women in the nine Ouagadougou Partnership countries use modern contraceptive methods. Between 2015 and 2018, the number of women using modern contraceptive methods in these countries grew by 1.4 million. Another 817,000 women must elect to take up modern methods to reach the target of 2.2 million additional users by 2020. Of the 5.4 million women who give birth each year in the nine countries, only 43% receive the minimum of four antenatal care visits recommended by the World Health Organization (WHO), and fewer than two-thirds (62%) give birth in a health facility. Each year, 28% of women who experience medical complications during pregnancy or delivery do not receive the care they or their newborns need. A total of 950,000 women and 1.6 million newborns need—but do not receive—care for complications. In 2018, an estimated 27,600 women in the Ouagadougou Partnership countries died from complications of pregnancy, birth, abortion or miscarriage, and 165,000 babies died in the first month of life. Deaths like these could be prevented with adequate medical care. 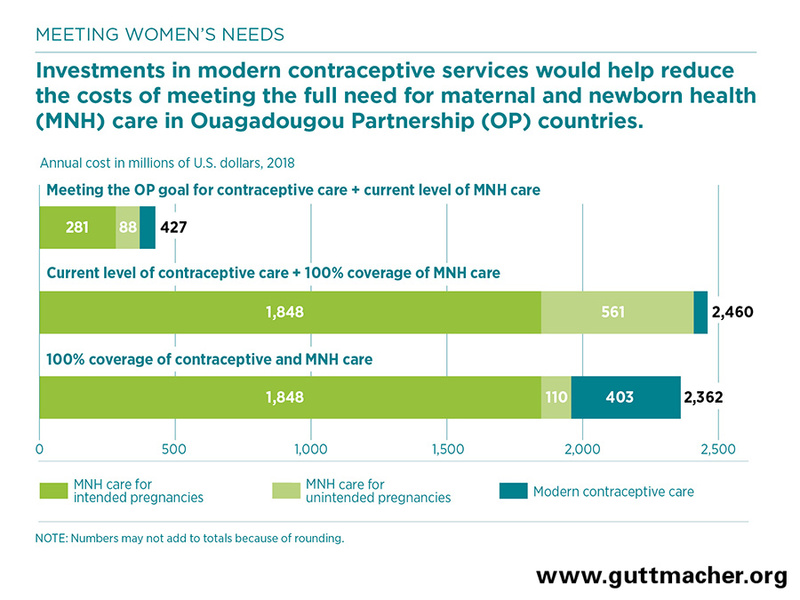 If the Ouagadougou Partnership goal of increasing the number of modern contraceptive users by 2.2 million were met and all pregnant women and their infants received the recommended maternal and newborn health care, maternal deaths would drop by 68%, to 8,900 per year, and newborn deaths would drop by 81%, to 30,600. Providing coverage for all current modern contraceptive users and for 817,000 additional users would cost $58 million annually, or $0.41 per capita per year. Because contraceptive use prevents unintended pregnancies and reduces the need for related care, providing modern contraceptive services to 817,000 additional users would decrease the annual cost of maternal and newborn care from $376 million to $369 million. Assuming the Ouagadougou Partnership meets its goal of 2.2 million additional modern method users, there will remain at least 8.0 million women in the nine countries who have an unmet need for modern contraception, meaning that they do not wish to have a child in the next two years but are not using a modern contraceptive method. Furthermore, millions of women are currently not receiving essential maternal and newborn care. There is a pressing need to increase investments in both contraceptive services and maternal and newborn care. Providing current levels of contraceptive care while fully meeting all pregnant women’s needs for maternal and newborn care would cost about $2.5 billion annually. However, fully meeting women’s needs for modern contraception and maternal and newborn care simultaneously will actually cost less: $2.4 billion annually in the nine countries. Investing in contraceptive and maternal and newborn services together would therefore result in a net savings of $98 million, in addition to improving health outcomes for women and newborns. The cost of preventing an unintended pregnancy through modern contraceptive use is lower than the cost of providing care for an unintended pregnancy. For each additional dollar spent on contraceptive services, the cost of pregnancy-related care would drop by $1.28. An investment of $16.94 per capita per year would help ensure that all unmet need for modern contraception is met, and that all women and newborns in these countries receive essential maternal and newborn care. Investing in contraceptive services and maternal and newborn health care together would save money, and this strategy would have a larger impact in preventing deaths and improving the health of women and their families than would investing in either set of services alone. The effectiveness of simultaneously investing in contraceptive and maternal and newborn health services can be enhanced by integrating the provision of these two sets of services. For example, postpartum care visits provide an excellent opportunity to offer contraceptive care. Numerous barriers to providing care must be tackled, including policy restrictions, weak health systems, shortages of trained health personnel, lack of outreach to disadvantaged and vulnerable people, and social and economic factors that prevent people from obtaining or using services. *Cost estimates are in 2018 U.S. dollars and are based on the costs of commodities and supplies, health personnel, and programs and systems needed to provide WHO-recommended care (see Darroch JE, Adding It Up: Investing in Contraception and Maternal and Newborn Health, 2017—Estimation Methodology, New York: Guttmacher Institute, 2018). The information reported here is based on data produced for Guttmacher Institute, Adding it up: investing in contraception and maternal and newborn health, 2017, Fact Sheet, New York: Guttmacher Institute, 2017, https://www.guttmacher.org/fact-sheet/adding-it-up-contraception-mnh-2017, and on the following sources: FP2020, Core indicator estimates: FP2020 2017–2018 progress report, 2018, http://progress.familyplanning2020.org/sites/default/files/FP2020_2018_FullEstimateTables_ONLINE.xlsx; and Track20, Ouagadougou Partnership estimates—November 2018, 2018, http://track20.org/pages/our_work/global_analysis/OP_support.php. This fact sheet was made possible by support to the Guttmacher Institute, including UK Aid from the UK Government and grants from the Bill & Melinda Gates Foundation and the Dutch Ministry of Foreign Affairs. The views expressed are those of the authors and do not necessarily reflect the positions and policies of the donors.